Back in the early 2000s online poker was starting to pick up some speed, and two things were certain: no self-respecting professional poker player would ever dream of getting bested by an online poker player, and the level of online poker was generally much weaker than the game played in casinos or tournaments, or even the level of online poker today. It was all about to change in just a couple of short years. In 2003 everything was about to change. Chris Moneymaker, an ordinary poker player that spent his time playing the game online, managed to win a ticket to the popular World Series of Poker Main Event. His entry cost just $35 and he won a ticket worth thousands of dollars. At the time, satellites for major poker tournaments were few and far between, and people weren’t exactly putting their faith in them. But after Moneymaker managed to turn the measly $35 he spent into more than a million dollars, after winning the coveted WSOP Main Event title. Moneymaker’s achievement sparked a revolution in the game of poker. People trying to retrace his steps flooded online poker sites and so online poker became one of the most played games in the world, both in number of actual games being played and loyal users. Never in a million years would people have thought in the late 1990s or early 2000s that today a single online poker site will number dozens of millions of active players, and hundreds of thousands of players online at any given moment. Nearly everything you see in this industry today was possible thanks to Chris Moneymaker’s achievement! Nowadays, there’s basically no difference between the online poker industry and live poker. Major poker tournaments are being organized every few weeks, with players joining in either by paying the buy-in or by winning a seat from the satellite tournaments. And the prizes have grown, as well! Nowadays it’s not unusual to see online poker players earning millions of dollars from the largest tournaments out there. Making it as an online poker player is no longer a struggle, it’s a fantastic journey! One of the latest examples of a big win from online poker comes from Giacomo Fundaro, the player who in early December won close to $170,000 in the Mazagan stage of the World Poker Tour. A small stage in a big tournament, yet its first prize is a fifth that of the largest online poker tournament in the world just nine years ago. Fundaro managed to overcome some very powerful adversaries in order to seize this win, and nowhere was it tougher than in the final table, when he went up against players like Davidi Kitai, the 2012 EPT Berlin winner who fell short after losing in the heads-up stage. The online poker scene shows no sign of slowing down. After Full Tilt went under for more than a year, it came back with a vengeance, and it showed that anything is possible and that there’s still room to grow in. 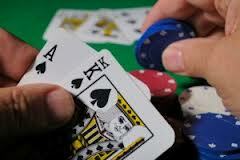 So if your dream is to make it big on the poker scene make sure you check out online poker as a viable alternative. Online poker sites are waiting for you to sign up, and just like our favorite online casinos, your arrival will not go unnoticed, as there are a lot of prize and bonuses there to greet you!